Javi here. I've got an amazing song to share with you today. It's from the band The National doing a gorgeously haunting rendition of the in-universe song, "The Rains of Castamere", from the HBO original show, GAME OF THRONES. 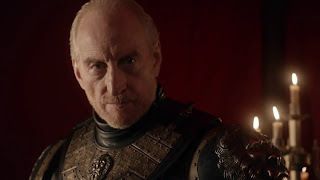 According to the Game of Thrones Wiki, the song details Tywin Lannister's victory against House Ryene who rebelled against his father Tytos Lannister. From the sounds of the song, he didn't just defeat House Ryene, he completely annihilated them. Given this, I have no clue why Listen to the song below, Antiquiet, where I found the song video is saying that there's spoilers for the show since this happened in the past, but just to be safe, SPOILER WARNING(?). Check out the song below.